BROMSGROVE remain in third place after running out convincing winners in an entertaining clash at Fintall Park on Saturday. Chris Danks, Dave Lewis and Phil Horton all grabbed braces while Tom Millen and Kevin Foster also got on the scoresheet to give the hosts a half century of points. 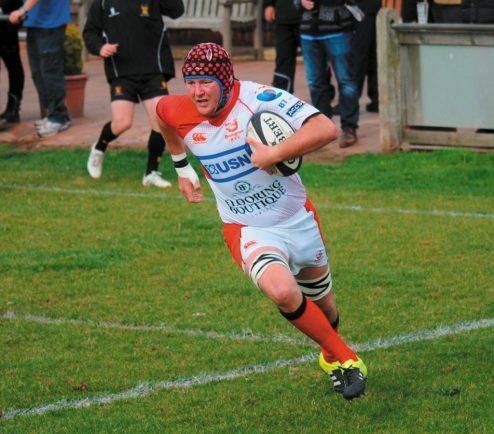 Longton notched up five tries to return home with a bonus point, but it was Bromsgrove’s day as they kept the pressure on top two Hinckley and Old Halesonians. Dan Protherough’s men set the tone with two tries in the opening 12 minutes. Millen got the first after good handling before Danks touched down which Jon Critchlow converted to open up a 12-0 lead. Injuries to Millen and Critchlow disrupted their momentum and saw Longton close the gap with a superb solo try from Tumanawapohatu Tawhai. But back came the hosts with captain Horton leading the line and finding himself in good positions to offload and put players into space. Kevin Foster was the recipient of a lovely weighted inside pass from Horton on 22 minutes and dotted it down under the posts. Danks took over the kicking duties and slotted home the conversion. Horton was the provider again on the 27th minute when he released Lewis who went over to make it 24-5. It was not all one-way traffic, though, as Longton had long periods of time with the ball and closed the gap when Ethan Clowes was dragged over. However, ill-discipline was costing them as Heath and Siupeli Vaipulu were both sin binned either side of another Tawhai try and Bromsgrove began to hammer home their advantage after the break. Danks registered his second try of the match and the bonus point after a series of powerful scrums before a bizarre kick by Lee Brogan gifted Bromsgrove another. The Longton fly half attempted clearance kick from behind the goal line looped up in the air and was picked off by the ever alert Horton, who gratefully touched it down. Bromsgrove had their tails up and Lewis added to the score when he beat defenders to go in under the post to give Danks an easy conversion and move the scoreline to 43-15. Despite the deficit, Longont battled hard to get something out of the game, and were rewarded for their efforts with the bonus point try scored by Joe Newton Taylor. Horton appeared to have finished the scoring when he crossed with time running out, but it was Longton who had the final word as Rich Thompson clash over at the death. Hallam added the extras.